If there’s something The North Face is familiar with, it’s adventure. If there’s something BMW Motorrad is familiar with, it’s adventure as well. What happens when the two come together? More adventure! While it was showcasing its latest techs in the form of a self-riding R 1200 GS outside of CES, inside the Las Vegas Convention Center, BMW had a little something different lined up. A little something along the lines of a modern tiny trailer camper. If this doesn’t want to make you sleep under the stars, I don’t know what will. The work is that of BMW’s Designworks who drew inspiration from the manufacturer’s 2008 GINA concept car that introduced an aesthetic embedded in geometry. 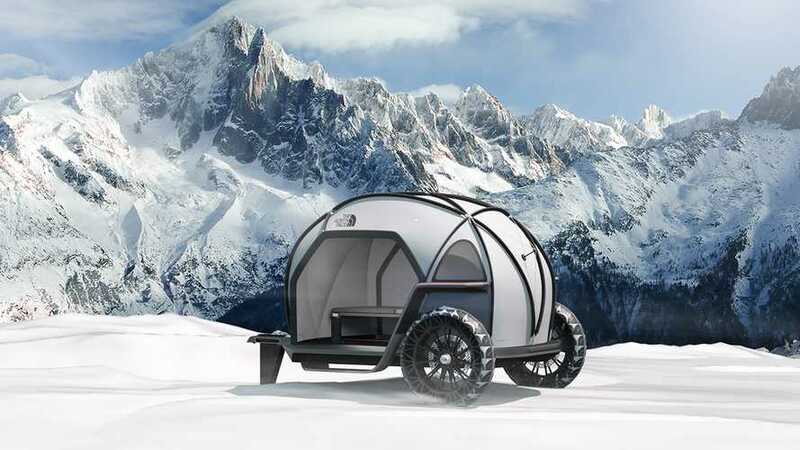 In collaboration with The North Face, a company that thrives in the realm of outdoor gear and get up, the two companies came up with a high tech miniature camper trailer that allows you to take your bed wherever you go. In comes the Futurelight concept. As the name indicates, the design is lightweight, making the trailer easy to tow around by any type of vehicle. The concept showcases a new fabric technology developed by The North Face that is both waterproof and breathable. 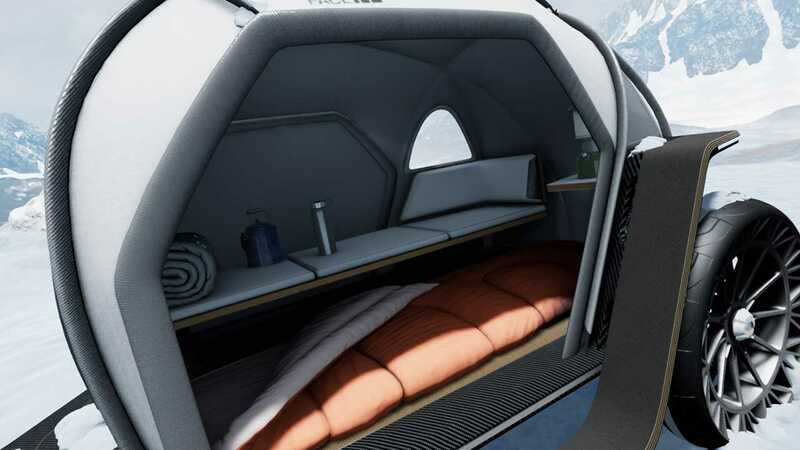 The Futurelight material is stretched over a geodesic dome in the concept, creating a rigid tent-like habitat for one person to sleep in. The display featured a virtual reality experience for the visitors who got to check out the camper up close. This is only one of the possible applications of the fabric, aside from apparel, and the new material will be available to customers later this year. As for the small camper, there is no current plan to send it to production. Should it eventually become reality—with the addition of a door of course—this could be a pretty convenient piece of equipment any fan of moto-camping would appreciate. Just throw all the gear inside instead of packing the bag and you have a camper that doubles as a trailer. Until then, however, we’ll have to keep packing our tents and sleeping bags rolled up on the passenger seat.